In a world when music is no longer composed by many real artists with real feelings, Henry Metal comes through as an incredible, contemporary musician. Despite his musical culture being absolutely vast, his preferences go back to the sweet, old times, when important messages were conveyed with anger and passion through the notes of bass and guitars. His latest album, ‘The Maestro Abides’, has just been released as the third one in his whole musical career. Each one of the nine tracks could look like it has been curated with nonchalance at first, but the work behind it is, actually, unimaginable. Even though Henry Metal’s surrealist words may seem odd in some parts, in fact, at a second listen one can understand their deepness along with the high quality performing of the musical composition, made with technique by a real artist. The lyrics of the album are, therefore, understandable on many levels, reaching every time a new meaning and a new possible interpretation. The first song, ‘Thought Police (A Song For America) speaks out about the U.S. conceptions of freedom of speech and their contradictions, along with making use of references from American cult movies. This and every other track can prove Henry Metal’s passion about his work. In a recent interview, in fact, he stated he doesn’t want to get rich. He doesn’t even care if people like his songs or not- this is what drives his inspiration and what makes the work realer when compared to many other metal artists who sell themselves to the press. 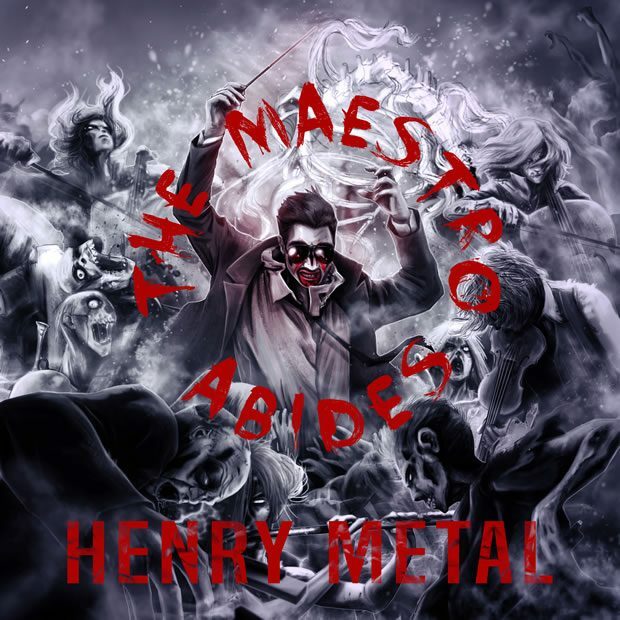 Henry Metal’s album covers are always artistic and enigmatic, and this last one is as well. Like an orchestra conductor orchestrates the instruments, our metal artist wakes us up. The colors, grey and white, depict the souls that arise at the gestures of the maestro, but him and only him is more on the red tones and fueled by passion.